Yeah, but: It has to be seen to be believed. 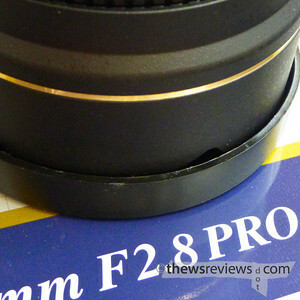 The Long Version: The Tokina AT-X 16-28mm f/2.8 PRO FX clearly isn't a pretentious lens. With a list price around $1100 Canadian, it's Tokina's 'full-frame' version of their wildly popular 11-16/2.8, and is a welcome addition to the wide-angle options for the 24x36 set. I'm glad to see it and I wish it well; I've never really used the lens, but I've heard some nice things about it. 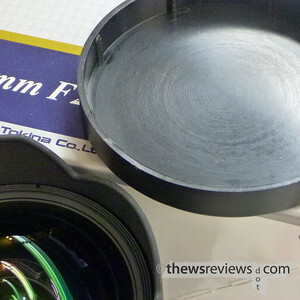 This review is simply of its lens cap. Made of a soft and flexible plastic, the Tokina 16-28's unbranded cap has shallow ridges that provide only a feeble grip on the hood some of the time. Other times the round hood mates with the round cap in a way that gives it no grip at all. None. I've done this trick with the caps on each of the three lenses that I've tested, including both Canon and Nikon mounts. Words can't convey the reality of it, so I've done an eighteen second MOS video. 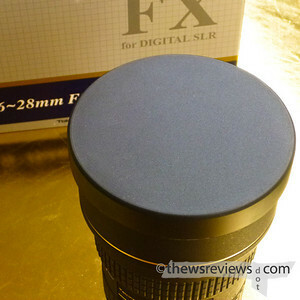 Hands down, no question, without a doubt: this is the worst lens cap I've ever seen. You could use the metal cap from the Olympus 7-14 to prop up an artillery shell; the plastic caps from the Panasonic 7-14 and Nikon 14-24 aren't as impressive but they are still incredibly solid. Like the cap for the Tokina 16-28, all of these work to protect the bulging front element by attaching with a pressure-fit around the outside of the built-in petal hood. This design failure isn't the result of Tokina trying a daring new idea: even the press-on plastic tail cap from a Nikon 50/1.8D puts this front cap to shame. The problems still don't stop when the Tokina cap is attached firmly enough that its own weight won't dislodge it. It can be knocked off by even a slight bump or nudge; I'd be mildly concerned about losing it if it wasn't guaranteed to fall off while the lens is still in the camera bag. The cap also isn't deep enough to completely cover the gaps in the petal-shaped lens hood, so it doesn't even protect against dust. This might also be a good time to point out that the lens can't take filters, and the width of its vision requires a shallow hood. The only real option to protect this lens, after spending a thousand dollars on it, is to spring a little extra for a neoprene Hood Hat. Nice. There are certain things that I would like to take for granted, and the ability of a company with as much experience as Tokina – a division of Hoya, and a stablemate of Pentax – to design a lens cap that works properly shouldn't be too much to ask. Sure, Canon hasn't yet discovered the centre-pinch design, but this stuff shouldn't be pushing the state of the art. It boggles my mind that something this flawed made its way into the box of a shipping product, let alone a lens as expensive as this one. It can't be an accident that Tokina doesn't put their name on it. updated: rumour has it that there is an improved mkII lens cap out there, and it can be ordered through an authorized dealer as a replacement for the one that I've reviewed here. It may even already be installed on some of the more recently made lenses. I would like to thank Tokina for giving people one more example of how important it is to buy from a real local camera store, and hope to have a further update once I've been able to try out the new design. updated once more: I've now seen the new design in person – both of them, in fact. One is a branded press-on cap that's deeper and made of rigid plastic, while the other is an elaborate design that clips into place and offers excellent protection. Lens caps can indeed be swapped out, but the store has to pay for the new caps up-front and is only reimbursed when the old models are sent back to them, and the cost isn't insignificant. Replacing the lousy design that I've reviewed here may not be all that easy. At least it's just the lens cap, and not part of the lens itself that falls off easily. … and at least there's no ambiguity about its quality, either. I suppose there's a certain integrity in that. Tokina (USA Distributor) said they will give anyone a new lens cap who bought the lens and received the old cap (even if you didn't get a card saying there would be a new cap). The better lens caps - branded and with full coverage - are included on the newer lenses. I highly recommend shopping for this lens at a store that will let you, the buyer, try it out before buying one. If it has this original lens cap, politely but firmly ask them to check the other boxes to see if there's a proper cap available. Remember that the mount (Canon or Nikon fit) doesn't matter, so the store should have at least one additional lens in stock. The store, now that they're aware of the issue, can contact their distributor for the proper replacement caps, and everyone wins.